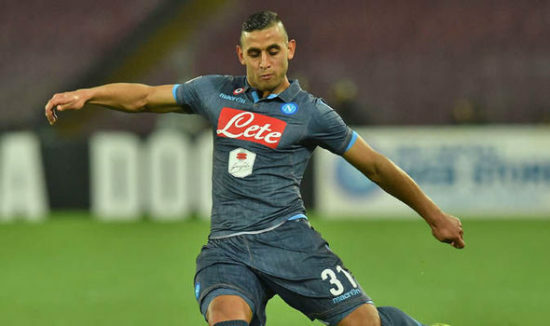 According to reports from the Daily Express, Manchester united are on the cusp of signing Faouzi Ghoulam from Napoli. The Algeria defender has been given the permission to leave his present club. The English Club are desperately in need of reinforcements, with Mourinho insisting in a statement in mid-December about the need for more funding to compete with leading team Manchester City. The club have targeted the player to shore up their defensive options, largely due to his impressive performances in Serie A and Napoli’s willingness to sell for a good price. According to sources, the Club have backed Mourinho’s demands by giving the Portuguese a large transfer war chest, this has led to reports that Mourinho will weigh up bids for Atletico Madrid’s Antoine Griezmann and Ghoulam with the latter rumoured to have a sealed a deal with the club. Manchester united have had to contend with a series of injuries at the back this season, Eric Bailey has been out with a long-term injury while Chris Smalling have had to battle with niggling injuries. The potential signing of Ghoulam has led to rumours been rife about exits at the club, Matteo Darmian has been linked to a return to his native Italy while English left back Luke Shaw, who was publicly berated by Mourinho over his weight and lack of fitness last season has also been recently linked with a switch away from the club. Ghoulam would add composure to Mourinho’s erratic defence, and would be an upgrade to Lindelof who has been error-prone since his £40 million switch from Benfica last summer.